Is a proprietary blend of enzymes that aid in the disintegration, targeting, and absorption of all plant-based substances. These enzymes bind with free-floating proteins that limit their destructive tendencies, which allows for maximum absorption of all nutrients.This helps to deliver the specific nutrients necessary for muscle and tissue repair, as well as for vibrant immune system function. Digests fragments of viruses and reduce inflammation and infections. Helpful in maintaining proper gall bladder function. Breaks down carbohydrates, specifically polysaccharides. May help relieve environmental sensitivities and allergies. Useful in helping prevent gastrointestinal problems and discomfort. Aids in the digestion of foods that are difficult to digest such as beans, legumes and cruciferous vegetables such as cabbage, broccoli and cauliflower. Used in the-digesting the milk sugar lactose. May be beneficial for those suffering from irritable bowel syndrome and other digestive disorders that are adversely effected by dairy products. Helps remedy digestive problems such as malabsorption. Cellulase is a very important enzyme because the human body cannot produce it on its own. Aids in the breaking down the sugar xylose. Used to break down carbohydrates such as pectin (found in many fruits). Breaks down carbohydrates called hemi-celluloses, which are found in plant foods. Helps to digest the sugar known as mannose. Breaks down carbohydrates, specifically phytates (phytic acid), found in many difficult to digest grains and beans. Shown to be useful for those suffering from serious bowel disorders that result in an inability to handle phytates. May increase mineral absorption and the bioavailability of iron, zinc, calcium, and magnesium. Used to break down polysaccharides and fibers known as beta glucans. May speed the recovery of injuries and swelling resulting from athletics, childbirth and surgery. Gastrointestinal discomfort due to intestinal parasites. Contains very powerful protein digesting enzymes. Commonly used to treat nausea and motion sickness. Is a great source of easily assimilated nutrients. Provides the mineral co-factors necessary to enhance the functions of the enzymes. By stimulating the immune system, it can also improve the body's response to viral and respiratory infections. 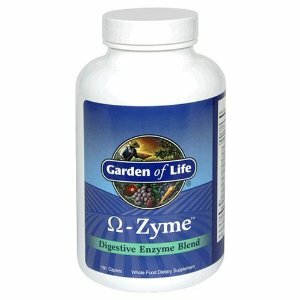 Garden of Life's Omegazyme maintains both the small and large intestinal environments, assisting in cleansing them of toxic residues and waste. It is ideal to use when you stray from eating a well balanced diet. DIRECTIONS: Take 1 to 4 caplets with each meal and 1 to 2 caplets with each snack. Usage should depend on the digestive health of the individual and the amount of the processed food included in the meal or snack. Other Ingredients: Maltodextrin, microcrystalline cellulose, vegetable coating, sodium croscarmellose, magnesium stearate (vegetable source), silicon dioxide, probiotic cultures.
. This product is made with natural ingredients.